I am so excited to share with you all the Silver Birth Pregnancy Care Packages! I’ve spent the better part of 2018 working on these bad boys, and it doesn’t even seem real that they’re finally ready. My goal in creating these mama boxes was to celebrate the journey of the pregnant woman. I truly believe that a pregnant woman is as close to God as we can get. There is real magic there. It only makes sense that she deserves to feel beautiful and empowered. When someone is pregnant most questions they receive are generally about the baby; “when are you due?” “do you know if it’s a boy or girl?” “*insert unsolicited advice here*”. Whenever I hear that someone is pregnant, I always make sure to ask them though, “how are you feeling?”. Pregnancy & motherhood, while magical, also comes with some downsides, some of which include feeling like you’re losing your identity, your body feeling foreign & different, fear & uncertainty about the whole situation, etc. All of which is completely normal. Women during this time deserve to treat themselves. To have a long, luxuriating bath, to connect with their baby by relaxing & rubbing a soothing belly butter on their tummy, to eat some super yummy treats, and even more. This is why I decided to create these care packages. 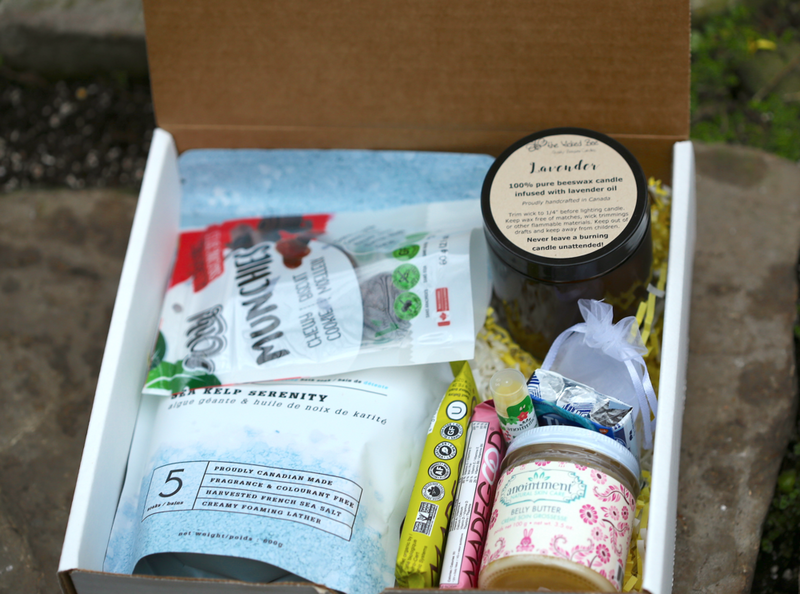 During the start of this huge life change, receiving this mama box will help any women tune back into herself, as well as her baby. A perfect gift to give at a baby shower, or just simply because you love her. Each CRUSH bath soak melts effortlessly into the bathwater creating a lovely foaming lather in the tub. This bath soak is phthalate free, paraben free, SLS free, colourant free, & artificial fragrance free. Canadian made & designed. French grey sea salt based, containing lavender essential oil, shea butter, and Atlantic algae sea kelp. This soak puts the bather into sleep-mode after their bath, and helps balance uneven skin pigment. The Moonstone is the crystal for childbirth and other feminine qualities. It's a stone of intuition and new beginnings. Carry it with you to bring good luck. These delicious, nutritious bars are nut free, gluten free, free of most allergens, vegan, & certified non-GMO. With one full serving of vegetables from six different sources these granola bars are a great source of fibre, vitamins, and minerals, which can help contribute to a healthy digestive and immune system. Cruelty free, gluten free, and vegan, this belly butter smells heavenly. Containing no synthetic preservatives, this product has a shelf life of approximately 12 months. A great way to connect with your growing child, and nourish your skin with the amazing elements of shea butter, virgin coconut oil, and cocoa butter. Keeps skin moisturized and supple during pregnancy. This moisturizing lip balm contains jojoba & avocado oils, certified organic Canadian-grown sunflower oil from Quebec, and fragrant Canadian beeswax from Manitoba. Flavoured with pure peppermint essential oil. With a burn time of approximately 25 hours, this candle is the perfect companion whenever you need to relax, and will work perfectly during labour for a nice atmospheric touch. Burning beeswax is healthy for you and the environment. When burned, beeswax purifies the air naturally of dust and mould. It is a great product that gently freshens the air with the smell of honey & lavender. Tums is a calcium carbonate antacid. Providing relief from heartburn & indigestion (which is all too common during pregnancy), Tums is also a great source of calcium. Keep these handy for relief any time of day. These date-based snacks are free from the top 8 allergens in Canada, and just happen to be a great source for helping to shorten labour. Each bite is jam packed with real, wholesome ingredients that you can pronounce and (most importantly) are healthy, so you can snack stress-free. A beautiful little card you can keep on your fridge or displayed in your bedroom to ease your mind about birth. There are some affirmations which you can repeat every day, the BRAIN acronym (handy decision making tool for labour), and some tips for getting labour started & ways to help your cervix open. I really hope you enjoy the care packages! A whole lot of love went into the entire process of making them! Will you be purchasing one? Let me know in the comments!